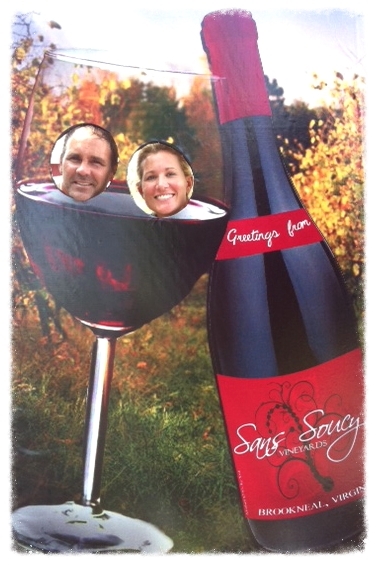 The friendly and knowledgeable Anctil family is enthusiastic to present visitors with wines from the Sans Soucy portfolio. No admission fee. Wine and beer flights available for purchase. A former tobacco farm, the vineyard area was chosen for its gentle hillside slope. Effort was put into achieving an ideal soil composition to promote healthy vine growth prior to planting. Weather, soil and geographic data indicate many parallels between Southern Spain and our own vineyard’s conditions. Vineyard planning began in the 1999 and in Spring 2001; the first 5 acres were planted using VSP (Vertical Shoot Positioning) trellising. The vines include a combination of Bordeaux, Alsatian, and Rhone varietals with a few experimental rows planted to discover what might yield the best results. In 2004, an additional acre of Tempranillo, a Spanish grape which thrives in clay soil, was planted.In the evening, the cooling effect works its way down the slopes to the natural amphitheater with a pond at the bottom. We have a large deck at the side of the pond which we enjoy during our summer bullfrog concerts, weddings, and for our annual Shrimp & Wine Fest. With regard to vineyard management, careful attention is paid to pruning in the winter to prepare for bud break, which on average takes place during the 2nd week in April. During the Spring, our schedule is busy with shoot thinning and selection for the year’s growing season. As Spring becomes Summer, we are out keeping an eye on the leaves, shoot placement, and continue thinning. Our Traminette grape requires the most time and thinning, as it is truly an aggressive growing grape. As we head into Fall, we will have dropped fruit so that the vines can focus their energies more on quality fruit, rather than growing for volume at harvest. Our grape varietals are harvested progressively, usually beginning in mid to late August with our Tempranillo grapes. "Tempranillo" is the diminutive of the Spanish temprano ("early"), a reference to the fact that it ripens several weeks earlier than most Spanish red grapes. We’ll finish harvest, depending on the weather’s effects on the grapes, in late October or early November with our Petit Verdot. Our harvest process is rather unique. Since the temperatures in our vineyard drop significantly over night, and we prefer to chill our grapes prior to fermentation starting, we’ve adopted a “starlight harvest schedule”. We harvest by the light of the moon and the stars. The result is less stress on the grapes, no bugs attacking the fruit or our harvesting crew, and no sunburn. Besides the common-sense approach to the harvest, it is truly a magical experience. We strive to finish harvest by 7am, and enjoy an early-morning breakfast feast. We open up harvest to a limited number of guests each year and invite them to participate in our Vine to Wine Weekend where we harvest, enjoy a vineyard breakfast, enjoy a relaxing spa afternoon, and return for a nighttime celebration amongst the vines with food, wine, celebration, and music. Select grapes are put into tobacco drying barns that are on what was once part of the originial farm. We dry these grapes in a method adapted from the Italian style known as Appassimento. The result is our Legacy wine, which is prwhich is produced in limited batches embracing an important part of the tobacco growing legacy of our region and adapting the old-world drying process to our winemaking.